A Martian meteorite recently found on Earth may represent a missing link between Mars' warm, wet past and its present cold and dry state, a new study shows. The rock, which was discovered in Morocco in 2011, is of a previously unknown class that could fill in gaps in scientists' understanding of the Red Planet's geological history, researchers said. The meteorite — named NWA 7034 — is markedly dissimilar from other meteorites from Mars that scientists have studied on Earth. NWA 7034 has about 10 times more water content (about 6,000 parts per million) than any of the 110 other known meteorites that have fallen to Earth from Mars, suggesting that the meteorite probably came from the Martian surface, as opposed to deeper inside, said University of New Mexico planetary scientist Carl Agee, lead author of a paper describing the findings published in the Jan. 3 issue of the online journal Science Express. The researchers think NWA 7034 represents the remains of a volcanic eruption on the Martian surface that occurred about 2.1 billion years ago. The meteorite was once lava from the eruption that cooled and hardened on the surface of the planet. The rock's cooling was probably aided by water on Mars' surface that was eventually imprinted on the chemical composition of the meteorite. The meteorite's age is also of interest to scientists. Most of the SNC meteorite samples date to only around 1.3 billion years ago, with the oldest being about 4.5 billion years old. 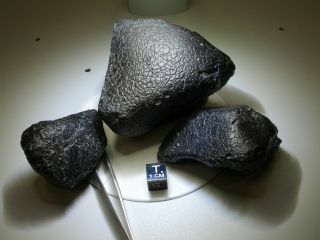 NWA 7034 represents a transition between the oldest and youngest Martian meteorite samples found on Earth, Agee said. "Many scientists think that Mars was warm and wet in its early history, but the planet's climate changed over time," Agee said. Eventually, the Red Planet lost its atmosphere and became the cold, dry desert it is today. The new meteorite comes from the transitional period between these extremes, making it an important find for scientists hoping to learn how the Martian climate change occurred. Agee's conclusions are supported by data collected by the Mars rover missions and spacecraft in orbit around the planet, he said. The geochemical composition of the new meteorite falls in line with the rocks that rovers have analyzed on the surface of the Red Planet. The researchers confirmed the meteorite's Martian origins using a process of elimination. It took six months for Agee and his team to confidently report that the piece of space rock came from Mars. Because of the meteorite's age, they knew it couldn't come from an asteroid: All asteroids are much older than 2.1 billion years — most are probably at least 4.5 billion years old. "We knew that it had to be from a planet," Agee said. Mercury wasn't an option: the composition of the volcanic meteorite didn't match the surface of the closest planet to the sun. Venus didn't fit either. Scientists hypothesize that that planet's surface is too dry to produce a meteorite with NWA 7034's water content, Agee added. Mars was the only viable option, and with mounting evidence suggesting that the meteorite was similar in composition to the rocks analyzed by rovers, Agee's hypothesis fit.